The flight of the sandhill crane, the sight of sunning alligators, the lights of the Agri-Civic Center, the Festival of Speckled Perch, the full pens at the cattle auction, the fine horses on the rodeo grounds, the levels of the water of the Lake, the flashing of lightning on the horizon, the limitless sky and towering thunderstorms, and the evening beauty at sunset… these things tell you that you are home in Okeechobee. 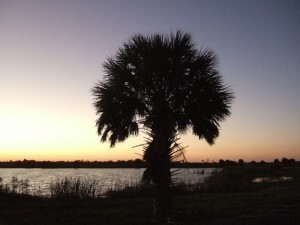 Okeechobee City is a small town that links the natural beauty and industry of Florida. 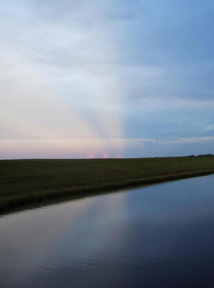 It brings together the agriculture, produce and citrus industries of the surrounding county with the wonderful freshwater fishing of Lake Okeechobee. The town sits at the headwaters of the lake, uniting east and west Florida with roads and canals, and north and south Florida with older, storied roads. Okeechobee is a classic Old Florida city, where the history of Florida skims just under the surface – only a road or turn or story away. The name is Native American, uniting the words oka [water] and chobi [big], meaning “Big Water.” And it is big! 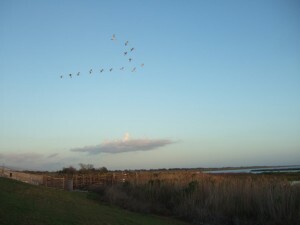 The lake measures over 730 square miles, and provides water for South Florida and crucial watershed for the Everglades. The area lives and breathes with the lake. As Lake Okeechobee goes, so goes life in the Everglades and Palm Beaches. It is a place of beauty and history, where Old Florida maintains its natural sense and yet reaches forward for new destiny. Yet, for all its possibility, Okeechobee is a rural county with growing pains, and the inherent life challenges that brings. There is a vital need for Christian mission in this county. It is the vision of Okeechobee Presbyterian Church to share the light of Jesus Christ in this unique place, meeting our neighbors and friends at a point of need.